I want my horse to put all four feet on a pedestal…but she keeps stepping off…any advice? 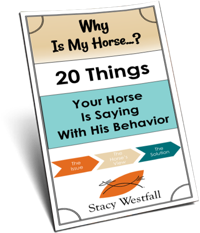 “Stacy, my horse, Dixie, has learned and mastered placing two front feet on a small box. Now, I think she could master all four feet on a pedestal. Any advice on how to teach her to do this? And how big the box should be? She’s a 12 yr old QH BTW. I think if I ask her to move forward in order to get her back feet up she will just step off the box. Thanks!”-Christine C.
The smaller the box or pedestal, the more challenging it will be. 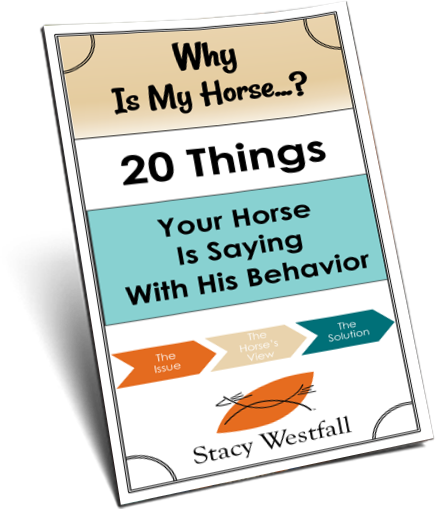 I love teaching horses ‘tricks’ because it gets both the horse and the human thinking outside the box…so to speak. I believe this is because ‘tricks’ are usually nontraditional training, so the humans tend to bring fewer bad habits into the process. The problem you described with your horse stepping off the front of the box is common. One of the reasons for this common response is that we often teach horses to walk across objects; walk over the pole, walk over the tarp, walk over the bridge…so the horse just figures “walk over the pedestal.” Makes sense if you look at it that way. To change this with your mare you need to teach her not to expect to walk off the pedestal. One way to do this would be to alway back her off. This way she will learn that her front feet go up on…but they never go all the way over. If you have been allowing her to walk off the other side then this will take awhile to become a habit, but once it does it will make it much easier to keep her on the box. As for how big the box or pedestal should be, that is up to you. The smaller the pedestal the more challenging it will be. You might start with a larger, easier, box and then progress to smaller sizes as she gets more confident. It is possible for horses to stand on very small pedestals but it is more physically demanding and takes more practice learning to balance. If you do choose to go with a very small box or pedestal you might want to consider putting a small ‘lip’ on the front of the box. This doesn’t have to be very thick, just a slim board a half inch to an inch in height will work. This way your horse can ‘find’ the front of the box by bumping her front feet into the lip which will leave more room for her hind end. 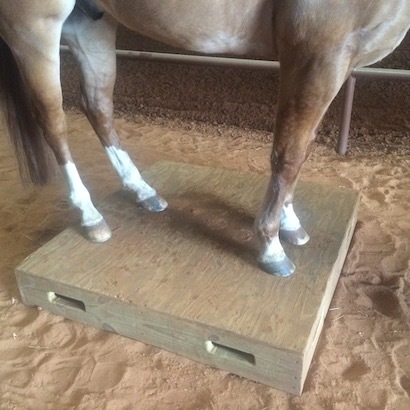 This isn’t necessary on a four foot by four foot box, but if the pedestal becomes two feet by two feet your horse will need to have all four feet properly placed for success. ← What is the differences between a lunge whip or stick & string (carrot stick)? I have used this philosophy to get my horses that try to back off the trailer before I’m ready to unload from the front, usually. Of course I’m lucky to have a trailer with a side ramp – but the idea of not getting them into habits where they can anticipate your request is a good one. Now they wait til I decide which direction they will need to go to get off the trailer.